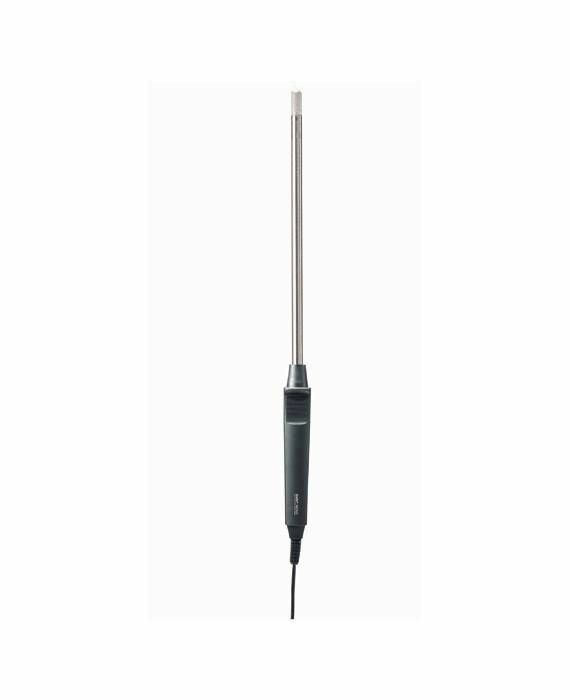 When connected to the testo 635 humidity and temperature measuring instrument, the robust humidity probe measures the relative humidity and temperature in storage, refrigerated and work areas or in air conditioning/ventilation ducts. In addition, a material equilibrium moisture content measurement can be carried out. To do this, the function for calculating the H2O content must be activated on the measuring instrument and the material of the object being measured must be set (anhydrite flowing screed, cement flowing screed, lime sand brick, concrete, high-insulation brick, solid brick, hard wood, soft wood, aerated concrete and particle board). The probe can also be connected to the testo 435-2 and testo 435-4 measuring instruments (however without the possibility of the measuring material equilibrium moisture content). Robust humidity probe with 1.8 m fixed cable.